These little bites of sweetness and spice pack a flavor punch, thanks to Vanns Chai Spice. Sometimes you just need a little taste of sweetness at the end of a meal to make it feel complete - not even a full-sized cookie, but one or two bites. Or you want a little something to go with your afternoon tea or coffee. That's where these date balls step in. 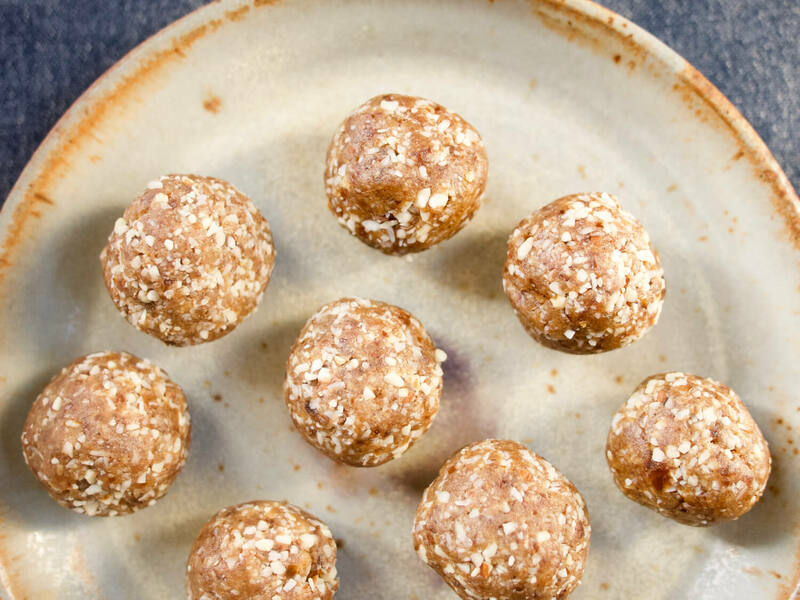 Just two bites each (or one, if you really want to go for it), the sweetness of medjool dates combines with the nuttiness of cashews and the creaminess of coconut, all blended together with aromatic Vanns Chai Spice to create the perfect burst of flavor. Just a few minutes with your food processor, and you'll have enough portable dessert snacks to last you through the week! Combine cashews and almonds in a food processor and pulse until coarsely ground. Add remaining ingredients and process until the mixture is evenly combine and starting to come together into a ball. Use a tablespoon measure to scoop out heaping spoonfuls of the mixture. Press each scoop in your hands to compress the mixture into a solid mass, then roll between palms to create rounded balls. Refrigerate to firm up. Store in the fridge for up to 1 week, or freeze for up to 3 months. Thaw in the fridge overnight before serving, if frozen. These toasted and spiced nuts couldn’t be simpler, and couldn’t be more of an impressive dish to toss together to bring to a cocktail party. A combination of earthy coriander, cumin, and turmeric play beautifully off the natural nutty sweetness of cashews, with cayenne and salt adding a pop of salt and spice. Oven-baked sweet potato fries dusted with a savory seasoning mix pair perfectly with a slightly sweet, smoky aioli. Creamy raita and tangy tomato chutney offer the perfect accompaniment to these crispy, savory, Indian-spiced potato patties spiked with a generous amount of spinach. This mix of Vanns spices, nuts, and seeds, toasted and coarsely ground, can add flavor and sophistication to a variety of savory dishes. A simple Spanish stew uses technique and a bold combination of spices to elevate affordable, healthy ingredients. This is it, folks. This is the perfect, unexpected, amazing vegetable soup, adapted from Michael Solomonov’s beast of a cookbook Zahav. This recipe is the perfect example of his brilliant and unusual use of commonplace spices and other ingredients.